There has been an ever so slight taste of fall in the air here. If you aren't a true Floridian it may be difficult to feel it, but it's there! 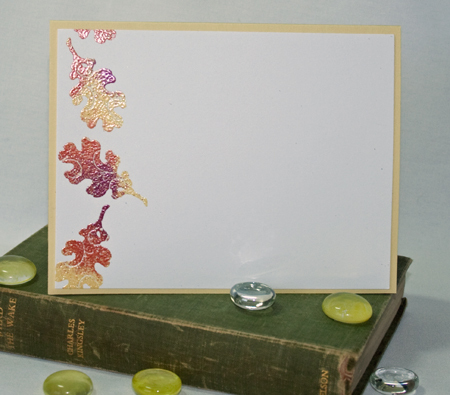 At Sparkle N Sprinkle their are new Fall Marbled Embossing Powders! And that made me want to dig out my Fall Leaves stamp set and play! I made the background by covering the entire piece of cardstock with Versamark then sprinkling bits of the different colors, one at a time, over the entire piece. Then heating it from underneath to prevent the marbled chunks from blowing away. This is called a Batik Technique. Then I stamped the leaves with Versamark and embossed the leaves with Teddy Brown EP right on top of the other layer of ep's, that makes the two layers melt together and it gives it an inlayed look. 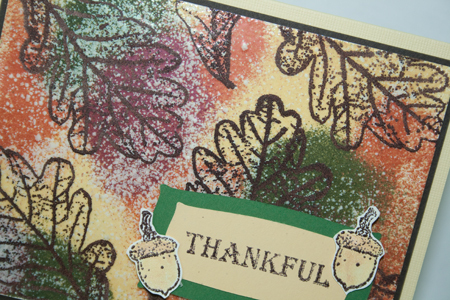 I used my Autumn Swirl stamp set on the inside to stamp the leaves and batiked them also. Hope you have a great day and enjoy some time outside!